After more than three decades together, iconic rock ‘n roll band MÖTLEY CRÜE announced today their Final Tour and the band’s ultimate retirement. The announcement was solidified when the band signed a formal Cessation Of Touring Agreement, effective at the end of 2015, in front of global media in Los Angeles today. Celebrating the announcement of this Final Tour, the band will perform on ABC’s Jimmy Kimmel Live TONIGHT and will appear on CBS This Morning TOMORROW MORNING. 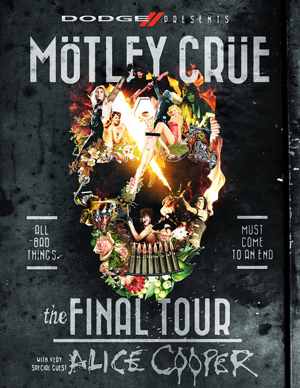 The Final Tour will coincide with the film made from MÖTLEY CRÜE’s NY Times Best-Selling book The Dirt. Jeff Tremaine (Bad Grandpa) has signed on to direct the opus that is set to debut in theaters globally in 2015, coinciding with The Final Tour. The Dirt is not only one of the best selling rock books of all time but also one of the greatest rock books of all time because of its brutal honesty, its unique voice, its multiple perspectives on the same events and its first-person inclusion of all members of the same band. Most rock memoirs are salacious mud-slinging accounts of a single person and MÖTLEY CRÜE was adamant to include the perspectives of all four of its members. Tremaine’s intention is to make, not just a great movie about a band, but a great movie about four misfits who, despite themselves and everyone else, band together to overcome the odds and change the history of Rock & Roll. The Dirt is a movie I’ve wanted to make ever since I read the book in 2002,” says Tremaine. “I relate to the story on so many levels; my whole professional career has been about boys behaving badly, so I have a real connection to the material. It’s awesome to be working with the band at such an exciting time in MÖTLEY CRÜE’s history.” The film will be produced by the members of MÖTLEY CRÜE, Rick Yorn, Julie Yorn, Erik Olsen and 10th Street Entertainment. MÖTLEY CRÜE Fan Club members will get the exclusive first crack at tickets and VIP Packages, via a unique code, beginning on Wednesday, January 29th starting at 10am local time. VIP ticket packages will be made available to the general public on Thursday, January 30th at 10am local time. The general public ticket on-sale for most shows is Friday, January 31st. All tickets and packages can be obtained via Ticketmaster.com, LiveNation.com, or via MotleyVIP.com.